Look at this Design! 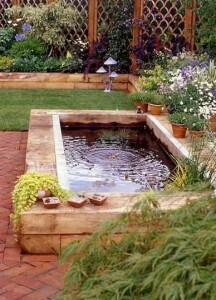 Railway Sleepers Used to Frame a Pond and as a Retaining Wall! Reclaimed Bricks Used to Create a Patio Area Perfect for those Summer Nights! Contact Us Today to Learn More about Our Hard Landscaping Products. At The Strata Landscaping Centre we have all the materials you need to transform your outside space. Whether you have two acres or two square metres we can help you achieve the Garden of Your Dreams. The Strata Group deliver to homes and businesses across NI, Ireland and the UK. We offer Top Quality Products at competitive rates. Our sales people will advise you on the best materials for your project and strive to achieve the best possible customer service. Had a Nice Fresh Juice Smoothie this Morning! Great start to a Monday Morning- We are Feeling Energised and Positive for Our week ahead. What made it even better was seeing one of our Railway Sleepers used in a Unique Way. 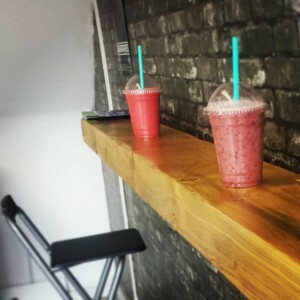 At NJs-Nu Juice in Cookstown they have used our Traditional Oak Railway Sleeper as a Handy High Rise Breakfast Bar for their customers. It makes the most of the space in the Shop and looks Elegant and Natural! We are very Proud to have one of Products used in a Local Business. Thank You Nu Juice!!! !